Help your pet bird develop coordination with the ''Peck A Mole'' bird toy! 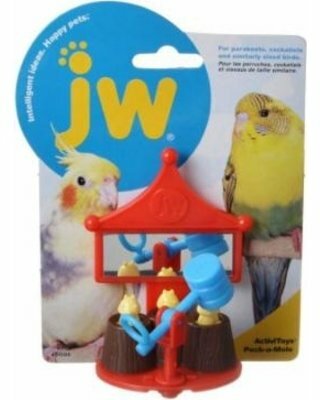 Peck A Mole is a part of the NEW carnival line of bird toys from JW. Brightly-colored to engage & entertain birds with fun features and bolt-on easy attachment! Peck A Mole features a shiny mirror that will attract instant attention. The Peck A Mole has a rattle hammer on a swivel base with a tiny handle for birds to manipulate. They can take the hammer and actually push down the tiny moles built into this adorable little toy! This type of toy combines a number of stimuli into one toy mirrors a rattle noise and moving objects to push and pull!